In at least two national parks in Africa, where poaching has been a huge problem, most female elephants are now born without tusks. Poachers hunting elephant ivory may have met their match in one of nature's greatest forces: natural selection. In at least two national parks in Africa, where poaching has been a huge problem, most female elephants are now born without tusks. Until the 1990s Gorongosa National Park in Mozambique was home to about 2,500 elephants. But during the civil war that raged from 1972 to 1992, about 90 per cent of that population was killed. Many of those elephants were slaughtered for their ivory tusks, which were sold to purchase weapons and food to feed the fighters. 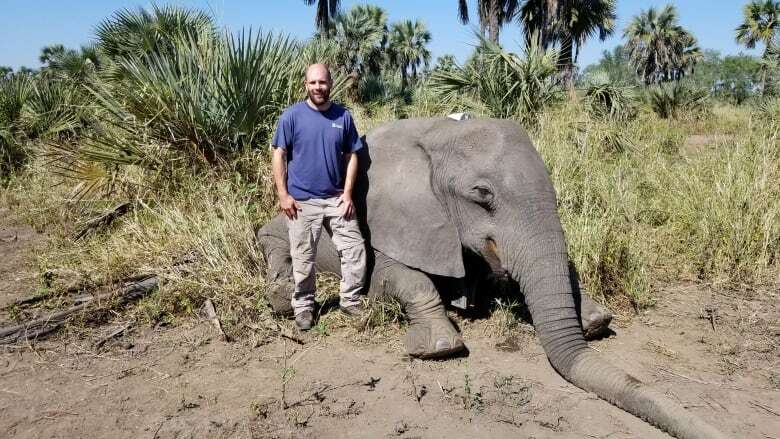 It now seems that this slaughter was a strong form of evolutionary selection on the elephants, which has increased the frequency of genetic variations that result in tusklessness in female elephants and smaller tusks in males. Ordinarily, fewer than four per cent of female elephants are born without tusks. But behavioural ecologist Ryan Long from the University of Idaho told Quirks & Quarks host Bob McDonald that there's been a massive shift in the population in Gorongosa. "Suddenly tusks become detrimental; they become a liability. So animals that have tusks and therefore have the genes to grow tusks are removed from the population by poachers. Animals that don't have tusks survive because they don't appeal to the poachers," Long explained. "And so their genes are passed on to the next generation. And you get an increase in the number of individuals that are born without tusks." In Addo Elephant National Park in South Africa, poaching pressure has resulted in an astounding 98 per cent of the 174 female elephants being born without tusks. And one heavily hunted area in Kenya has reported that elephant survivors have evolved much smaller tusks, a trait that has also been passed down to offspring. The tusks are about one-fifth smaller in males, and more than one-third smaller in females. Generally, the tusks of a male elephant are bigger and heavier than those of a female, so they tend to get poached first. But the reason why males, so far at least, have not evolved to be tuskless is not clear. Long says he thinks it may be related to the fact that males use their tusks to fight other elephants for access to females. "The benefits of males having tusks are very, very strong and so it's possible the genetic potential for tusklessness among male elephants has been weeded out of the male component of the population to much greater degree." The consequences, in terms of behavioural changes, for tuskless females are only beginning to be explored. Long says he's interested to learn how the tuskless elephants are getting by without them because they use tusks in so many ways. What do you do without your tusks? "They use them for foraging. They use them for stripping bark from trees. They use them for pushing trees over and they use them to dig for water. We know that tusks play this important role. So that seems to imply that somehow these tuskless individuals are compensating behaviorally for their lack of tusks. How that's happening, we have no idea." Other researchers have suggested that tuskless elephants may expand their home range in order to make up for their lack of foraging ability. So far the tuskless population is healthy and seems to be thriving. Researchers, including Long, are starting to monitor elephants with and without tusks for a comparison study over the coming months. For his part, Long says the elephants herds in Gorongosa simply don't look right. "It's interesting too to drive around in that park and see these big herds of elephants and and suddenly be hit with this recognition that something's missing. Something just isn't quite right here. It's that about 50 per cent of them don't have tusks."